What are you looking at (besides the tops of trash and recycling barrels, I mean)? 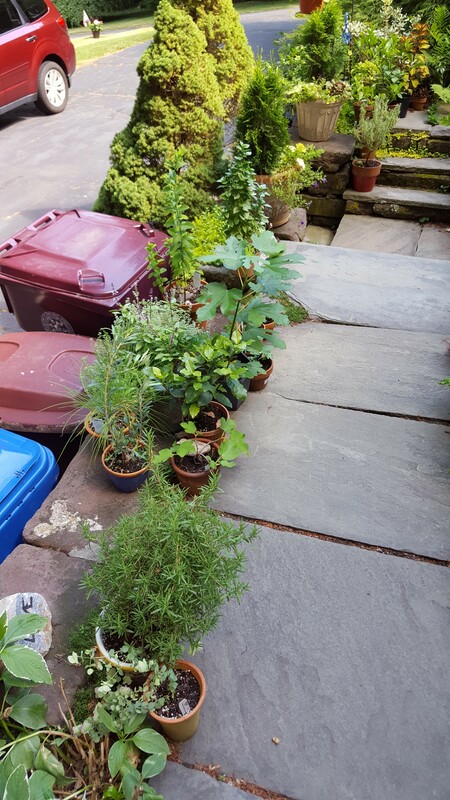 This motley collection of foliage is actually my herb and edible garden just outside my porch door. Yes, I have lots of herbs elsewhere on the property but if I am cooking, or even making a simple salad or sandwich, I may not want to go half an acre away to harvest them. So I pot up my most used herbs –basil, thyme, rosemary, mint and bay–where they are in easy reach. I also have my figs and olive tree here too. The banana and citrus are elsewhere. As for the “real” edibles like tomatoes, peppers and things like that? They’re in a raised bed with–what else? More herbs, of course! That’s in the back yard. These potted herbs also serve as season extenders. They come into the 3 season porch and I can harvest from them until almost January, depending on the year. The figs over-winter there as well. The olive has to come into the house (as do the bananas and citrus). But that’s okay. Winter is a long way off. And all those plants help me get through it. Previous Article Leaflets 3, Let It Be?